Financial aid, scholarships & grants may be used for this program. This three-credit course explores the complex history of Cambodia, Laos and Vietnam. We will examine the region prior to European imperialism, the impact of French colonialism from the late 1800s to the mid-1950s, and the legacy of American military involvement in the region during the last half of the twentieth century. Areas we will visit include Hanoi, Sapa, Vientiane, and Siem Reap. This opportunity is open to everyone who is interested in this part of the world. In addition to readings and lectures, participants will be able to interact with and learn from a variety of people in these multi-ethnic nations. 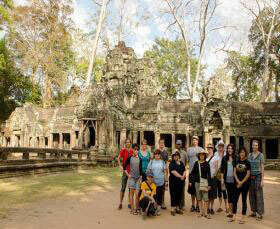 The program includes a three-day homestay in a Lao village.